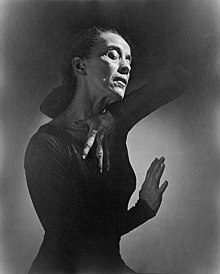 Allegheny (later Pittsburgh), Pennsylvania, U.S.
Martha Graham (May 11, 1894 – April 1, 1991) was an American modern dancer and choreographer. Her style, the Graham technique, reshaped American dance and is still taught worldwide. Graham was born in Allegheny City – later to become part of Pittsburgh, Pennsylvania – in 1894. Her father, George Graham, practiced as what in the Victorian era was known as an "alienist", a practitioner of an early form of psychiatry. The Grahams were strict Presbyterians. Dr. Graham was a third-generation American of Irish descent. Her mother, Jane Beers, was a second-generation American of Irish, Scots-Irish, and English ancestry, and claimed descent from Myles Standish. While her parents provided a comfortable environment in her youth, it was not one that encouraged dancing. When she left the Denishawn establishment in 1923, Graham did so with an urge to make dance an art form that was more grounded in the rawness of the human experience as opposed to just a mere form of entertainment. This motivated Graham to strip away the more decorative movements of ballet and of her training at the Denishawn school and focus more on the foundational aspects of movement. Graham's technique pioneered a principle known as "Contraction and Release" in modern dance, which was derived from a stylized conception of breathing. Contraction and Release: The desire to highlight a more base aspect of human movement led Graham to create the "contraction and release", for which she would become known for. Each movement could separately be used to express either positive or negative, freeing or constricting emotions depending on the placement of the head. The contraction and release were both the basis for Graham's weighted and grounded style, which is in direct opposition to classical ballet techniques that typically aim to create an illusion of weightlessness. To counter the more percussive and staccato movements, Graham eventually added the spiral shape to the vocabulary of her technique to incorporate a sense of fluidity. Following her first concert made up of solos, Graham created Heretic (1929), the first group piece of many that showcased a clear diversion from her days with Denishawn, and served as an insight to her work that would follow in the future. Made up of constricted and sharp movement with the dancers clothed unglamorously, the piece centered around the theme of rejection—one that would reoccur in other Graham works down the line. As time went on Graham moved away from the more stark design aesthetic she initially embraced, and began incorporating more elaborate sets and scenery to her work. To do this, she collaborated often with Isamu Noguchi—a Japanese American designer—whose eye for set design was a complimentary match to Graham's choreography. Within the many themes which Graham incorporated into her work, there were two that she seemed to adhere to the most—Americana and Greek Mythology. One of Graham's most known pieces that incorporates the American life theme is Appalachian Spring (1944). She collaborated with the composer Aaron Copland—who won a Pulitzer Prize for his work on the piece—and Noguchi, who created the nonliteral set. As she did often, Graham placed herself in her own piece as the bride of a newly married couple whose optimism for starting a new life together is countered by a grounded pioneer woman and a sermon giving revivalist. Two of Graham's pieces—Cave of Heart (1946) and Night Journey (1947)—display her intrigue not only with Greek mythology but also with the psyche of a woman, as both pieces retell Greek myths from a woman's point of view. In 1936, Graham created Chronicle which brought serious issues to the stage in a dramatic manner. Influenced by the Wall Street Crash of 1929, the Great Depression that followed, and the Spanish Civil War, the dance focused on depression and isolation, reflected in the dark nature of both the set and costumes. That same year, (1936) she declined Hitler's invitation to perform at the International Arts Festival, an event that ran alongside the Olympic Games in Berlin. 1938 became a big year for Graham; the Roosevelts invited Graham to dance at the White House, making her the first dancer to perform there. Also in 1938 Erick Hawkins became the first man to dance with her company. He officially joined her troupe the following year, dancing male lead in a number of Graham's works. They were married in July 1948 after the New York premiere of Night Journey. He left her troupe in 1951 and they divorced in 1954. On April 1, 1958, the Martha Graham Dance Company premiered the ballet Clytemnestra, based on the ancient Greek legend Clytemnestra and it became a huge success and great accomplishment for Graham. With a score by Egyptian-born composer Halim El-Dabh, this ballet was a large scale work and the only full-length work in Graham's career. Graham choreographed and danced the title role, spending almost the entire duration of the performance on the stage. The ballet was based on the Greek mythology of the same title and tells the story of Queen Clytemnestra who is married to King Agamemnon. Agamemnon sacrifices their daughter, Iphigenia, on a pyre, as an offering to the gods to assure fair winds to Troy, where the Trojan War rages. Upon Agamemnon's return after 10 years, Clytemnestra kills Agamemnon to avenge the murder of Iphigenia. Clytemnestra is then murdered by her son, Orestes, and the audience experiences Clytemnestra in the afterworld. This ballet was deemed a masterpiece of 20th-century American modernism and was so successful it had a limited engagement showing on Broadway. Graham resisted requests for her dances to be recorded because she believed that live performances should only exist on stage as they are experienced. There were a few notable exceptions. For example, in addition to her collaboration with Sunami in the 1920s, she also worked on a limited basis with still photographers Imogen Cunningham in the 1930s, and Barbara Morgan in the 1940s. Graham considered Philippe Halsman's photographs of Dark Meadow the most complete photographic record of any of her dances. Halsman also photographed in the 1940s Letter to the World, Cave of the Heart, Night Journey and Every Soul is a Circus. In later years her thinking on the matter evolved and others convinced her to let them recreate some of what was lost. In 1952 Graham allowed taping of her meeting and cultural exchange with famed deafblind author, activist and lecturer Helen Keller, who, after a visit to one of Graham's company rehearsals became a close friend and supporter. Graham was inspired by Keller's joy from and interpretation of dance, utilizing her body to feel the vibration of drums and sound of feet and movement of the air around her. In her biography Martha, Agnes de Mille cites Graham's last performance as having occurred on the evening of May 25, 1968, in Time of Snow. But in A Dancer's Life, biographer Russell Freedman lists the year of Graham's final performance as 1969. In her 1991 autobiography, Blood Memory, Graham herself lists her final performance as her 1970 appearance in Cortege of Eagles when she was 76 years old. Graham's choreographies span 181 compositions. Graham not only survived her hospital stay, but she rallied. In 1972, she quit drinking, returned to her studio, reorganized her company, and went on to choreograph ten new ballets and many revivals. Her last completed ballet was 1990's Maple Leaf Rag. Graham has been sometimes termed the "Picasso of Dance" in that her importance and influence to modern dance can be considered equivalent to what Pablo Picasso was to modern visual arts. Her impact has been also compared to the influence of Stravinsky on music and Frank Lloyd Wright on architecture. Martha Graham has been said to be the one that brought dance into the 20th century. Due to the work of her assistants, Linda Hodes, Pearl Lang, Diane Gray, Yuriko, and others, much of Graham's work and technique have been preserved. They taped interviews of Graham describing her entire technique and videos of her performances. As Glen Tetley told Agnes de Mille, "The wonderful thing about Martha in her good days was her generosity. So many people stole Martha's unique personal vocabulary, consciously or unconsciously, and performed it in concerts. I have never once heard Martha say, 'So-and-so has used my choreography.'" An entire movement was created by her that revolutionized the dance world and created what is known today as modern dance. Now, dancers all over the world study and perform modern dance. Choreographers and professional dancers look to her for inspiration. The greatest thing [Graham] ever said to me was in 1943 after the opening of Oklahoma!, when I suddenly had unexpected, flamboyant success for a work I thought was only fairly good, after years of neglect for work I thought was fine. I was bewildered and worried that my entire scale of values was untrustworthy. I talked to Martha. I remember the conversation well. It was in a Schrafft's restaurant over a soda. I confessed that I had a burning desire to be excellent, but no faith that I could be. Martha said to me, very quietly: "There is a vitality, a life force, an energy, a quickening that is translated through you into action, and because there is only one of you in all of time, this expression is unique. And if you block it, it will never exist through any other medium and it will be lost. The world will not have it. It is not your business to determine how good it is nor how valuable nor how it compares with other expressions. It is your business to keep it yours clearly and directly, to keep the channel open. You do not even have to believe in yourself or your work. You have to keep yourself open and aware to the urges that motivate you. Keep the channel open ... No artist is pleased. [There is] no satisfaction whatever at any time. There is only a queer divine dissatisfaction, a blessed unrest that keeps us marching and makes us more alive than the others." The Martha Graham Dance Company is the oldest dance company in America, founded in 1926. It has helped develop many famous dancers and choreographers of the 20th and 21st centuries including Erick Hawkins, Anna Sokolow, Merce Cunningham, Lila York, and Paul Taylor. It continues to perform, including at the Saratoga Performing Arts Center in June 2008. The company also performed in 2007 at the Museum of Contemporary Art, Chicago, with a program consisting of: Appalachian Spring, Embattled Garden, Errand into the Maze, and American Original. Graham's original female dancers consisted of Bessie Schonberg, Evelyn Sabin, Martha Hill, Gertrude Shurr, Anna Sokolow, Nelle Fisher, Dorothy Bird, Bonnie Bird, Sophie Maslow, May O'Donnell, Jane Dudley, Anita Alvarez, Pearl Lang, and Marjorie G. Mazia. A second group included Yuriko, Ethel Butler, Ethel Winter, Jean Erdman, Patricia Birch, Nina Fonaroff, Matt Turney, Mary Hinkson. The group of men dancers was made up of Erick Hawkins, Merce Cunningham, David Campbell, John Butler, Robert Cohan, Stuart Hodes, Glen Tetley, Bertram Ross, Paul Taylor, Donald McKayle, Mark Ryder, and William Carter. In 1957, Graham was elected a Fellow of the American Academy of Arts and Sciences. She was awarded the Presidential Medal of Freedom in 1976 by President Gerald Ford (the First Lady Betty Ford had danced with Graham in her youth). Ford declared her "a national treasure". In 1998 Graham was posthumously named "Dancer of the Century" by Time magazine, and one of the female "Icons of the Century" by People. This excerpt from John Martin's reviews in The New York Times provides insight on Graham's choreographic style. "Frequently the vividness and intensity of her purpose are so potent that on the rise of the curtain they strike like a blow, and in that moment one must decide whether he is for or against her. She boils down her moods and movements until they are devoid of all extraneous substances and are concentrated to the highest degree." See also: Category:Ballets by Martha Graham. 1946 Cave of the Heart Samuel Barber Sets by Isamu Noguchi, costumes by Edythe Gilfond, and lighting by Jean Rosenthal. ^ a b "TIME 100: Martha Graham". Time. August 6, 1998. Archived from the original on July 6, 2011. ^ Jowitt, Deborah (2012). "Martha Graham (1894–1991)" (PDF). Dance Heritage Coalition. Retrieved February 15, 2018. ^ "from Kathy Muir". Seattle Camera Club. Retrieved October 4, 2015. ^ Debra Craine; Judith Mackrell (August 19, 2010). The Oxford Dictionary of Dance. Oxford University Press. p. 196. ISBN 0-19-956344-6. ^ Klenke, Karin (2011). Women in Leadership: Contextual Dynamics and Boundaries. Bingley: Emerald. p. 208. ISBN 9780857245618. ^ Graham, Martha (1991). Blood memory. Doubleday. ISBN 978-0-385-26503-4. ^ Susan Ware (1998). Letter to the World: Seven Women who Shaped the American Century. W.W. Norton. ISBN 978-0-393-04652-6. ^ Bondi (1995) p. 74 quote: "Picasso of Dance ... Martha Graham was to modern dance what Pablo Picasso was to modern art." ^ Agnes de Mille (1991) p.vii quote: "Her achievement is equivalent to Picasso's," I said to Mark Ryder, a pupil and company member of Graham's, "I'm not sure I will accept him as deserving to be in her class." ^ "Martha Graham: About the Dancer". American Masters. NPR. September 16, 2005. Archived from the original on October 10, 2013. ^ "Google Doodle Celebrates Martha Graham and Dynamic Web". PC World. May 11, 2011. Archived from the original on July 2, 2013. ^ "Martha Graham Dance Company". Museum of Contemporary Art, Chicago. Archived from the original on September 19, 2011. Retrieved August 8, 2011. ^ Darnell, Tracie (April 17, 2007). "Martha Graham Dance Company returns to Chicago for long-awaited performance at MCA". Medill. Archived from the original on October 12, 2013. Retrieved August 8, 2011. ^ Cross, Mary (ed.). One Hundred People who Changed 20th-century America. p. 156. ^ October 3, 2015. "10 women honored at Hall of Fame induction". Democratandchronicle.com. Retrieved October 4, 2015. Bryant, Paula Pratt (1994). Martha Graham (The Importance Of ... Series). Detroit: Gale. Freedman, Russell (1998). Martha Graham – A Dancer's Life. New York City: Clarion Books. ISBN 978-0-395-74655-4. Bird, Dorothy; Greenberg, Joyce (2002). Bird's Eye View: Dancing With Martha Graham and on Broadway (reprint ed.). Pittsburgh, Pennsylvania: University of Pittsburgh Press. ISBN 978-0-8229-5791-1. Graham, Martha (1991). Blood Memory An autobiography. New York: Doubleday. ISBN 978-0-385-26503-4. Hawkins, Erick (1992). The Body Is a Clear Place and Other Statements on Dance. Hightstown, New Jersey: Princeton Book Co. ISBN 978-0-87127-166-2. Horosko, Marian (2002). Martha Graham The Evolution of Her Dance Theory and Training. Gainesville, FL: Univ. Press of Florida. ISBN 978-0-8130-2473-8. Morgan, Barbara (1980). Martha Graham Sixteen Dances in Photographs. Morgan & Morgan. ISBN 978-0-87100-176-4. Soares, Janet Mansfield (1992). Louis Horst Musician in a Dancer's World. Durham, North Carolina: Duke University Press. ISBN 978-0-8223-1226-0. Taylor, Paul (1987). Private Domain An Autobiography. New York: Knopf. ISBN 978-0-394-51683-7. Tracy, Robert (1997). Goddess – Martha Graham's Dancers Remember. Pompton Plains, New Jersey: Limelight Editions. ISBN 978-0-87910-086-5. Layman, Richard; Bondi, Victor (1995). American Decades 1940–1949. Gale Research International, Limited. ISBN 978-0-8103-5726-6.
de Mille, Agnes (1991). Martha: The Life and Work of Martha Graham. New York: Random House. ISBN 978-0-394-55643-7. Wikimedia Commons has media related to Martha Graham.